THE HAGUE - The Aruba government has been granted a period of two years to get its finances in order. The Kingdom Council of Ministers took this decision on Friday. Aruba Prime Minister Evelyn Wever-Croes announced the news after a meeting of the Kingdom Council of Ministers which she attended on Friday. She said Aruba had managed to convince the Kingdom government to give the island two more years to get its budget balanced in a sustainable manner and to aim for a budget surplus to start reducing the large national deficit. The prime minister said she was satisfied with the talks she had in The Hague last week. “We arrived at important agreements regarding our Financial Economic Memo (FEM) in the sense that our budget deficit has to turn into a surplus, our national debt has to go down,” she said after Friday’s meeting. She felt she had succeeded in taking the first step in restoring trust with The Hague, which was her main goal. State Secretary of Home Affairs and Kingdom Relations Raymond Knops was positive about the cooperation with the new Aruba government. “My cooperation with the prime minister is excellent. I have a feeling that the current government understands something has to happen to reduce the increasing debt,” he said. The state secretary said he found it very important that the Aruba government had cut back its cost of personnel. “Aruba has 6,000 civil servants for a population of some 100,000. That is really a lot,” he said. The Aruba Committee for Financial Supervision CAFT urged the previous government, run by the AVP party of Mike Eman, to reduce the cost of personnel, but despite warnings the number of civil servants kept expanding. 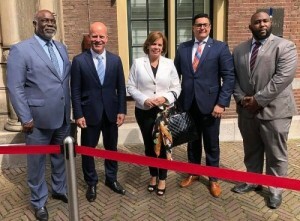 Minister Plenipotentiary Guillfred Besaril of Aruba, Minister Plenipotentiary Anthony Begina of Curaçao and Deputy Minister Plenipotentiary Hasani Ellis of St. Maarten attended Friday’s meeting, chaired by Dutch Prime Minister Mark Rutte.